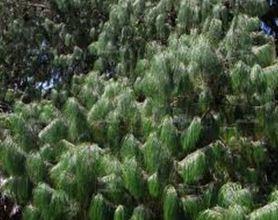 Mexican weeping pine | Infonet Biovision Home. It originated from Mexico and it has spread to many parts of the world. It is probably the most planted pine tree in tropical Africa and generally widespread as a plantation tree. It is widely cultivated and makes 30% of all plantation trees in Kenya. It should not be grown near crops due to its shallow root system which makes it to compete with crops for nutrients. P. patula is more suitable for woodlots. Its wood is white to pale brown and light and soft. It finds use in doors, furniture and house ceilings. Wide variations in daily temperatures may result in the wood cracking. It is tolerant of most soils and will grow in grassland. While growing best with over 1,000 mm rain and cool climate, it can also grow in more adverse conditions. There are large plantations of this species in western Kenya, the Lambwe Valley and parts of central province. Its spread in agro-ecological zones I - III. It may be propagated by sseedlings or wildings. It may be found in plantations and woodlots. P. patula is fast growing, taking 16 to 20 yrs for pulp production and 25 to 30 yrs for timber. Soil for pines should be inoculated by mixing in some soil collected beneath mature pine trees. 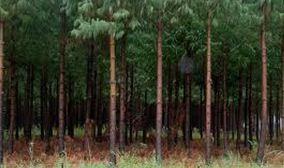 Pruning and thinning may be done for trees grown in timber plantation. Fuel: it produces excellent fuel wood. Fibre: The species is used in the commercial manufacture of pulp, for example in the Paper Mills. Timber: The wood is suitable for particle board manufacture and gives a board of good strength, does not appreciably retard the setting of cement and can be used satisfactorily for making wood-wool slabs and boards. Gum or resin: When tapped, P. patula yields an oleoresin, which is distilled to give turpentine, and rosin which is used in, for example, paint and batik industries. Medicine: Pine-leaf oil is sometimes used for medicinal baths, and the seeds may be consumed locally. Shade; provides shade in areas where is grown. Ornamental; it is beautiful and therefore a good ornamental tree. The majority of insect pests that cause damage to P. patula are defoliators, mainly of the order Lepidoptera, the notorious families being Arctiidae, Lasiocampidae, Noctuidae and Saturniidae. Damage begins from the nursery stage through cutworms, several leaf rollers and defoliators. Plantation pests include leaf-eating adult beetles, adult bark beetles (mottled pine bark weevil) and sucking insects such as pine woolly aphid. Diseases of P. patula include foliage leaf cast, tip die-back of the branches and armillaria root rot. Anon. 1986. The useful plants of India. Publications & Information Directorate, CSIR, New Delhi, India.